NASA has tested a new high-power ion engine which could give future spacecraft significantly more thrust to accomplish exploration of the solar system. The High Power Electric Propulsion (HiPEP) ion engine should eventually be 10 times as powerful as NASA’s Deep Space 1 ion engine which was tested a few years ago. An engine like this will probably power the JIMO probe allowing it to go into and out of orbit around several of Jupiter’s moons and map them in great detail. NASA’s Project Prometheus recently reached an important milestone with the first successful test of an engine that could lead to revolutionary propulsion capabilities for space exploration missions throughout the solar system and beyond. The test involved a High Power Electric Propulsion (HiPEP) ion engine. The event marked the first in a series of performance tests to demonstrate new high-velocity and high-power thrust needed for use in nuclear electric propulsion (NEP) applications. “The initial test went extremely well,” said Dr. John Foster, the primary investigator of the HiPEP ion engine at NASA’s Glenn Research Center (GRC), Cleveland. “The test involved the largest microwave ion thruster ever built. The use of microwaves for ionization would enable very long-life thrusters for probing the universe,” he said. The test was conducted in a vacuum chamber at GRC. The HiPEP ion engine was operated at power levels up to 12 kilowatts and over an equivalent range of exhaust velocities from 60,000 to 80,000 meters per second. The thruster is being designed to provide seven-to-ten-year lifetimes at high fuel efficiencies of more than 6,000-seconds specific impulse; a measure of how much thrust is generated per pound of fuel. This is a contrast to Space Shuttle main engines, which have a specific impulse of 460 seconds. 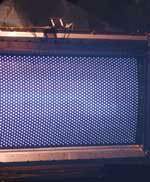 The HiPEP thruster operates by ionizing xenon gas with microwaves. At the rear of the engine is a pair of rectangular metal grids that are charged with 6,000 volts of electric potential. The force of this electric field exerts a strong electrostatic pull on the xenon ions, accelerating them and producing the thrust that propels the spacecraft. The rectangular shape, a departure from the cylindrical ion thrusters used before, was designed to allow for an increase in engine power and performance by means of stretching the engine. The use of microwaves should provide much longer life and ion-production capability compared to current state-of-the-art technologies. This new class of NEP thrusters will offer substantial performance advantages over the ion engine flown on Deep Space 1 in 1999. Overall improvements include up to a factor of 10 or more in power; a factor of two to three in fuel efficiency; a factor of four to five in grid voltage; a factor of five to eight in thruster lifetime; and a 30 percent improvement in overall thruster efficiency. GRC engineers will continue testing and development of this particular thruster model, culminating in performance tests at full power levels of 25 kilowatts. HiPEP is one of several candidate propulsion technologies under study by Project Prometheus for possible use on the first proposed flight mission, the Jupiter Icy Moons Orbiter (JIMO). Powered by a small nuclear reactor, electric thrusters would propel the JIMO spacecraft as it conducts close-range observations of Jupiter’s three icy moons, Ganymede, Callisto and Europa. The three moons could contain water, and where there is water, there is the possibility of life. Development of the HiPEP ion engine is being carried out by a team of engineers from GRC; Aerojet, Redmond, Wash.; Boeing Electron Dynamic Devices, Torrance, Calif.; Ohio Aerospace Institute, Cleveland; University of Michigan, Ann Arbor, Mich.; Colorado State University, Fort Collins, Colo.; and the University of Wisconsin, Madison, Wis.